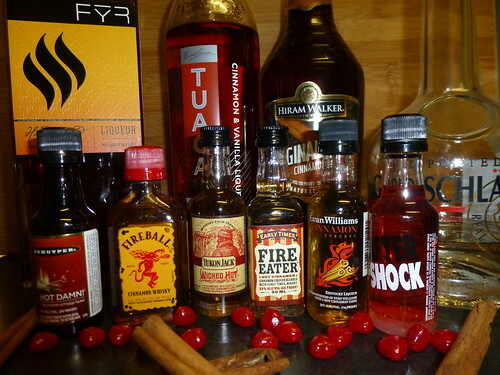 Cocktail Hacker » Blog Archive » Cinnamon Liqueurs – Red Hot or Not so Hot? Cinnamon Liqueurs – Red Hot or Not so Hot? Guest post by Elisabeth, Cocktail Hacktress in training. One of my favorite Valentine’s Day sweet treats is Red Hots candies. For the last couple years it has been difficult to find them in stores and I thought it would be fun to see if anything captures that spicy cinnamon sweetness of the candies. After hunting down a bunch of tiny sample bottles from the liquor stores, Reese and I sat down to taste 10 different cinnamon flavored alcohol products. First up – cinnamon liqueurs. Hot Damn (15% ABV): At 15 % ABV, this really isn’t going to warm you from the inside. In general, not worth it. Too watery to get the cinnamon punch, has a weird aftertaste and doesn’t even give you much in the way of cinnamon aroma. Aftershock (40 % ABV): Aftershock is the Icy/Hot of the alcohol world. It is very sweet, not too cinnamony and the finish is all menthol-like. Reese is always skeptical of pink liqueurs and, with this one, I would say he has good reason. Goldschlager (43.5% ABV): Goldschlager is actually something I had in my cabinet. I use it for my Naked in the Woods martini to give a slight cinnamon flavor and beautiful gold flakes. This is not a complex cinnamon liqueur, but a one note flavor. I like it, but Reese didn’t feel it was too authentic. Tuaca Cinnaster (35% ABV): Tuaca Cinnaster is a cinnamon and vanilla liqueur. My initial reaction to its aroma is that is smelled more like caramel than cinnamon and vanilla. The cinnamon flavor is more of an authentic cinnamon (not Red Hots) but it is not strong. The finish of this is vanilla and butter notes. Original Cinn (45% ABV): Reese was pretty happy to finally sample a brown liqueur rather than something artificially correction-pen red. This one actually tastes like real cinnamon and is very sweet. I personally felt this one tasted super sweet because of the authenticity of the cinnamon almost made it seem sweeter – maybe less burn than you’d get with a Red Hots type of flavor. A good choice if you are looking for an authentic cinnamon liqueur for a mixer. Fyr, by J&L Distilling in Colorado (50% ABV): I was intrigued by this one and hauled Reese out to the distillery to sample it. This was introduced to us as a “European style” liqueur. The cinnamon shines through beautifully, but there are other complexities to it (clove? orange? vanilla?). The spice flavor lingers on this and it definitely made me feel a little more grown-up where the others we sampled made me feel like I was doing shots on a ski trip. Next, we sampled some cinnamon whiskey, another popular flavor on the market right now. Fireball (33% ABV): I see this as the most recognizable cinnamon whiskey. The whiskey notes were not super strong, but did give the liquor more of a complex flavor than you typically get with the cinnamon schnapps we sampled above. This smells faintly of Red Hots, but you really felt the cinnamon in the back of your throat as this goes down. Yukon Jack Wicked Hot (35% ABV): The Yukon Jack tasted like cinnamon, was sweet, and had a little whiskey flavor. This was not and offensive cinnamon whiskey, but not particularly remarkable in any way. Fire Eater (33% ABV): The aroma of Fire Eater was very chemical in nature, which made me think it would taste worse than it did. It tasted like whiskey and left you with a cinnamon aftertaste. The cinnamon is more subtle in this whiskey versus in Fireball. Evan Williams Cinnamon Reserve (35% ABV): This particular cinnamon whiskey must be an acquired taste. When you smell it, you get faint cinnamon notes with a little bit of floral undertones. When you taste it, it tastes like you dropped your Red Hots into rose water. I’ve never had Evan Williams alone, but this cinnamon one was rather unusual. Overall, we recommend Original Cinn for a good cinnamon schnapps flavor. Of the whiskies, Fireball is a passable cinnamon whiskey if that’s your thing. And finally– if you really want something fantastic, get ahold of some Fyr from J&L Distilling in Colorado. You won’t regret it. **P.S. – After tasting 10 cinnamon liquors in one evening, we highly recommend you avoid this at all costs. It is a little rough on the stomach!